Arts & Crafts furniture finishes, especially the “proper” finish for quartersawn white oak are not difficult to achieve, if you know what you’re really after. A lot of woodworkers want the grain to “pop”, which is a worthy goal for some other woods like tiger maple. The authentic finish is more subdued, with the quartersawn flakes close in tone to the surrounding wood. 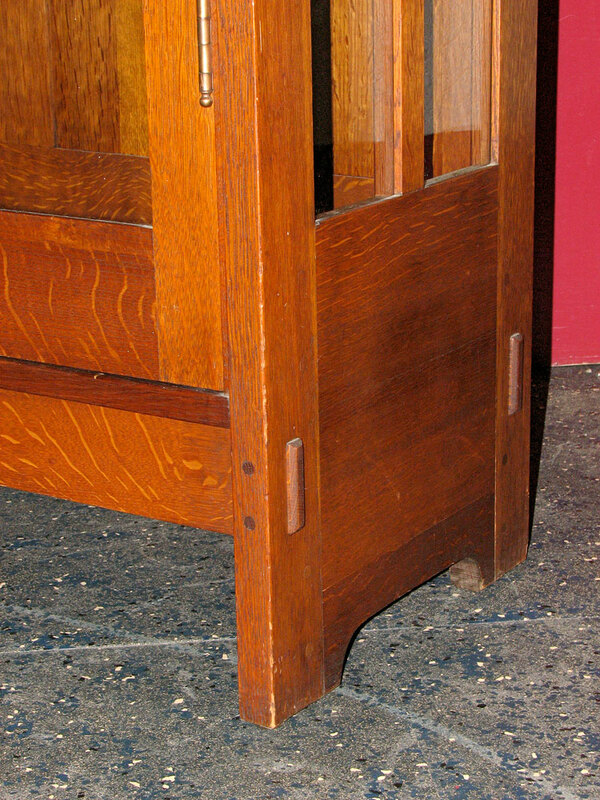 The photo shows a typical antique, with a light finish. There are several ways for the modern woodworker to achieve this look. If you have an adventurous streak, you can fume with ammonia, and follow the fuming with orange or garnet shellac. A safer, more predictable method is to use aniline dye, followed by shellac or lacquer. In the October 1905 issue of The Craftsman, Gus Stickley offered advice for the home woodworker, although “banana lacquer” is not to be found today. Banana lacquer was an early version of nitrocellulose lacquer, thinned with amyl acetate that gave it it’s distinctive odor. (and when you’re through with the finishing article, keep reading, some nice projects appear on the following pages. How would you build or put leaves (mounting) in the 599 dining room table? Great question Bob! So good, it gets its own post as a reply. Click Here to read that post.